Customer loyalty is built over time through a consumer’s interactions with a brand. Given the breadth and multi-faceted nature of customer experience, it is difficult to measure and quantify. The rise of digital interactions, has only added to this complexity. Net Promoter Score (NPS) is one of the most widely used customer loyalty metrics, though it’s usefulness as a silver bullet is a hotly debated topic among CX practitioners. 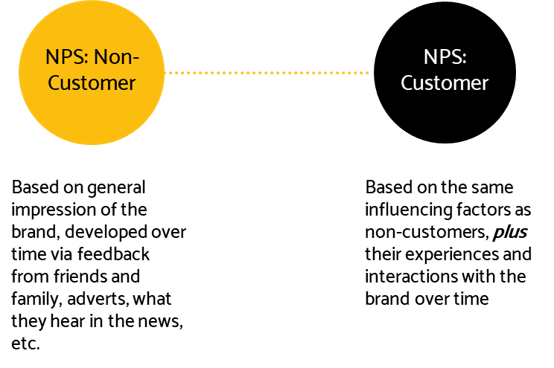 While NPS may not be perfect, it can be used to quantify customer experience. In 2017, Julia Ahlfeldt developed a methodology to do just that. One would expect customers to have a higher NPS score than the average consumer, but by how much? The ‘spread’ between customer and non-customer NPS scores indicates how successfully the company fostered loyalty by delivering good customer experiences. The higher the number of the Net Experience Effect, the more a consumer’s opinion improved based on their experiences as a customer. Contact Julia to find out more about how this methodology can be used by organizations to drive customer-centric change.